Boardwalk Empire returned this week, jumping forward a number of years in the story at the same time. Looking back on the past four years of Boardwalk there have been a number of character departures, often in increasingly bloody fashion. So as the show looks forward to its last hurrah, lets look back at the three most surprising (and soul crushing) character deaths of the past four seasons. Warning, spoilers ahead! Owen Sleater, comes with wooden box. Aaaah Owen, the loveable Irish rogue with a heart of gold. He gets the girl from under his boss’s nose, banters with all around him like the whimsical fellow he is, and he’s going to be daddy. What could possibly go wrong? 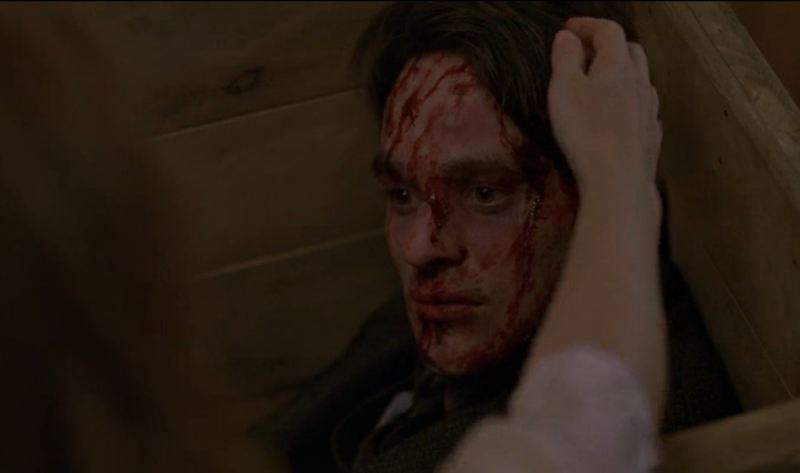 Despite all signs pointing towards a sticky end for Owen, when the box containing his body arrives at Nucky’s home it’s still a huge shock, with his demise coming off screen and somewhat out of the blue in grand scheme of the episode. His death also in turn led to Margaret’s decision to have a back room abortion in a tragic scene later in the season. Sad times! The surrogate son of Nucky Thompson, Jimmy Darmody was a damaged soul. Ambitious, yet scarred, even at the peak of his powers he never truly grasped Nucky’s crown, and ultimately wasn’t cut out to fill his shoes in the crime world. Damaged by war and a unsanitary relationship with his mother, Jimmy reached for the stars, but fell short at the hands of the man who helped him to reach the heights that he did. Billed as the show’s second lead, Jimmy seemed untouchable, but we all learned that Nucky was not someone afraid to get his hands dirty, even when it came to family. Jimmy was gunned down in cold blood, knowing that he had lost to the better man. A tragic end to a tragic character. Richard Harrow, the man, the myth, the legend. This one hurt. Poor Richard, all he wanted was a happily ever after, was that too much to ask for? For one, brief, fleeting moment it appeared as though it was all coming together for Richard, he was loved and in love, and his bizarre scrap book containing pictures of happy families was this close to becoming a reality. But alas, it was not to be for our hero. Farewell Richard, gone but not forgotten. In truth it had to come eventually. Despite his kind heart and well meaning nature, he was a killer, and boy did he kill a lot of people (particularly in one stunning scene as he rescues Jimmy’s son). Nevertheless he was a fan favourite, and he was given a bittersweet end to his story as he dreamt of the family he so nearly had. Previous Post Koba To Return In Planet Of The Apes Sequel?